Known as Hout-ka-Ptah in ancient times, meaning "Castle of the Ka of Ptah". 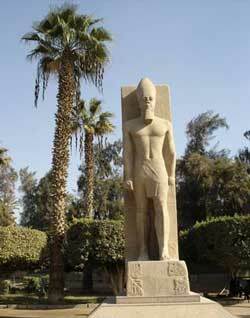 Memphis was the ancient capital of Egypt, founded by King Menes, the ruler who united Egypt in 3100 BC. Memphis has a great mystical heritage as the cult centre of Ptah, god of creation and architecture. 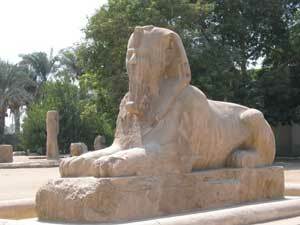 His wife Sekhmet is both creator and destroyer, and through their union they produced Nefertum, often depicted as a lotus flower. Many temples were built in Memphis to honour this divine trinity and the priesthood developed complex rituals as they explored the workings of the cosmos. Memphis was a key centre for the study of astronomy and the stellar priests were renowned for their knowledge of the stars. Located at a strategic place on the Nile where the river divides into the Delta, the annual inundation was most evident in this region. It was here that the sighting of the Sirius Star signalled the beginning of the Flood. Because of its connection with Menes, the first ruler of Egypt, all subsequent Pharaohs had to be crowned in Memphis, and this tradition continued up to the 18th Dynasty. Today you can visit the remains of the Apries Palace, where the Pharaohs of the Old Kingdom once resided, and the Temple of Ptah, one of the most important temples in Egypt. The beautiful gardens offer a relaxing place for meditation, as you gaze around at the many sculptures, surrounded by flowers and palm trees. Although much of the old city was taken to build Cairo over the centuries, the ruins have a haunting quality about them and the illustrious aura still lingers in the great stones. The Alabaster Sphinx is very striking, which some archaeologists believe to be an image of Hatshepsut. 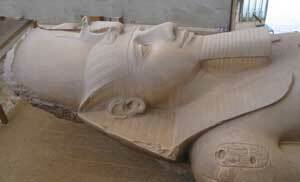 The Colossus of Rameses II is an impressive sight with the Pharaoh lying dormant, as if under a magic spell. The statue is 10 metres long and is housed in its own museum. 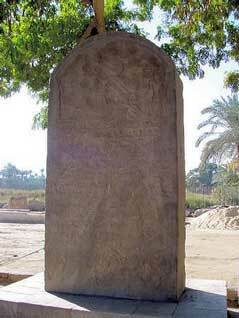 It was discovered by Giovanni Caviglia in 1820, near the Temple of Ptah. The colossus was offered to the British Museum, but was too cumbersome to transport such a distance, and so luckily it remained in Memphis. 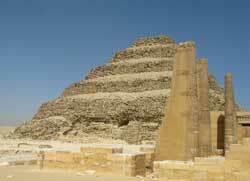 The site is a remarkable place as it houses some of the earliest pyramids from the 2nd and 3rd Dynasty. Here it is possible to witness an architectural revolution as the Egyptians began to build their complexes in stone, instead of wood and mud brick: The Step Pyramid was born. The structure was exceptional for its time and comprised of the Great Enclosure, a limestone wall surrounding many temples, shrines, columns and statues. It must have been impressive in its heyday, with brightly decorated chambers and chapels, leading into secret passages. Many of the underground tombs are over 130 metres long and were built to house the mummies of early Dynastic pharaohs. These early funerary complexes were the first of their kind and epitomise the cultural advancement found at this time. The Pyramid of Unas is famous for its funerary texts carved on the tomb walls. 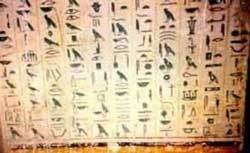 Called the Pyramid Texts, they are oldest religious documents in the world—and the first time the 128 esoteric spells appeared in a pharaonic tomb. These Pyramid Texts were written to assist the King on his hazardous journey through the Underworld and offer him safe passage to Amenti, the Afterlife. Unfortunately the Unas Pyramid is closed to the public, but it is possible to visit the Pyramid of Pepi I nearby. The famous funerary texts are written on the tomb walls, carefully restored for the visitor to enjoy.